Here are the Top 5 that caught my attention, for any number of reasons including but not limited to: the car itself; the car still exists here; the car seemed cheap; I was bored; I was intrigued. Ready? Go. Seems like clean examples of BMW’s little roadster have been getting expensive lately. Even first-year examples with the 1.9-liter M44 four-banger are now commanding more than ATM money. However, with winter coming fast to the North Woods, people are unloading convertibles on the quick. For example, a Mazda Miata in average condition is running half to two-thirds the asking price from not even five months ago. I was reminded how much I like Z3s the other night when a friend gave me a ride home from the baseball game in her 2001 2.5i 5-speed. 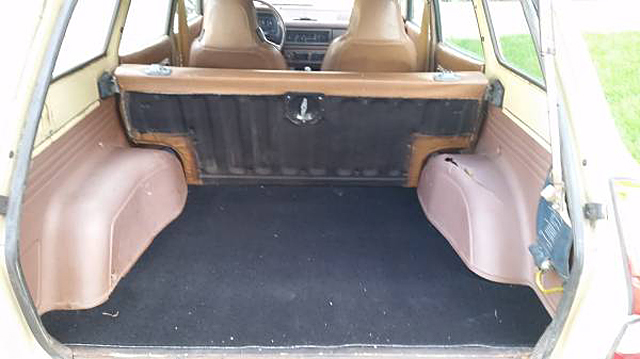 Resplendent in Impala brown over brown leather, with the tan top up it was quiet, tight, and free of rattles. It’s a lot of brown, but I love it. Additionally, my mother has a 1997 1.9 – a copy of James Bond’s ride circa Goldeneye – and despite being transmission-challenged it’s a fun little car. This black example could be a good deal at $4300. Information and pictures are thin, but at 132k miles it won’t be completely used up, especially with the new top. I’d be interested in knowing about any rust and if the interior is unraveling. The rest is easy on these cars: They’re basically glorified E30 318iC’s. 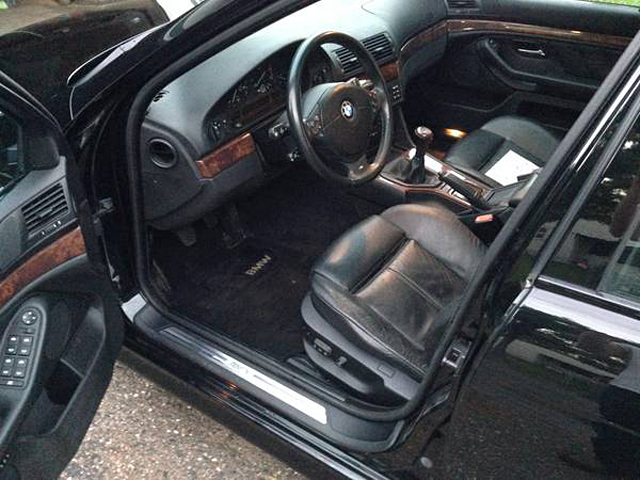 If you could get this Z3 closer to – or under – $4k, you’d have a couple more months of Fall driving on the cheap, assuming you wanted to put it away for the winter at all. 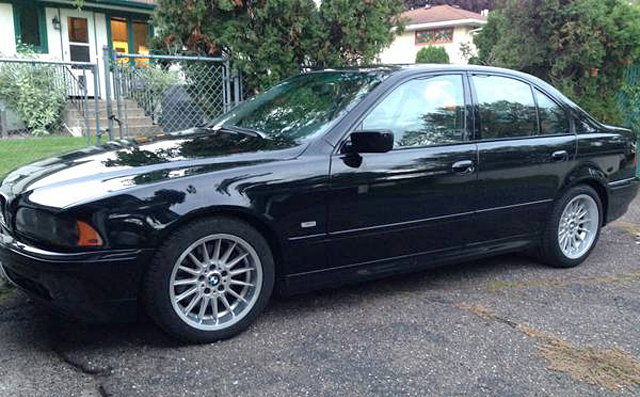 The E39 is the last generation of BMW 5 Series you can wrench on yourself. They have their share of black boxes in addition to miles of wiring, but you don’t have to take it to the dealer to code a door lock actuator or a new battery to the car (other items you do). They were an evolution of the previous 5er, rather than a clean-sheet reimagining of the species. And they made a lot of them with a proper, three-pedal, manual transmission. Just because you can wrench on it yourself doesn’t necessarily mean you’ll want to. The particularly nasty stuff has already been done on this 540i: valve cover gaskets; valley pan gasket; VANOS rebuild; timing chains and tensioners; and oil pan gaskets. The paint looks nice, but like all E39s in the upper Midwest the rust is starting to come through. No matter, because existing rust means you can happily drive it all year ‘round and not worry about that horrible sound of salt solution bathing every square inch. Other than being “meticulously maintained” there’s not a lot of information on this particular car’s cosmetic condition. That said, at 208k miles, the driver’s sport seat doesn’t look overly flat, so that has to be worth something. Oh, and did I mention it’s a 6-speed? I will admit to not knowing a whole lot about these. 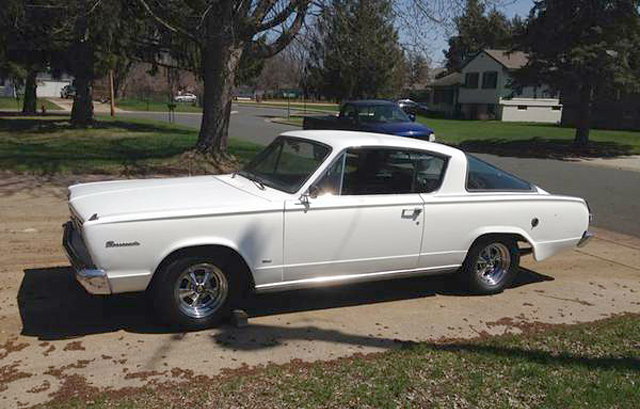 I just like the way early Barracudas look with their curved back glass, shark nose, and chrome spears on the rear quarters. The dollop of whipped cream on my imaginary pudding cup is the 4-speed manual transmission. I’m sure most American cars from this time period are preferable with a slushbox, but as usual I don’t care. 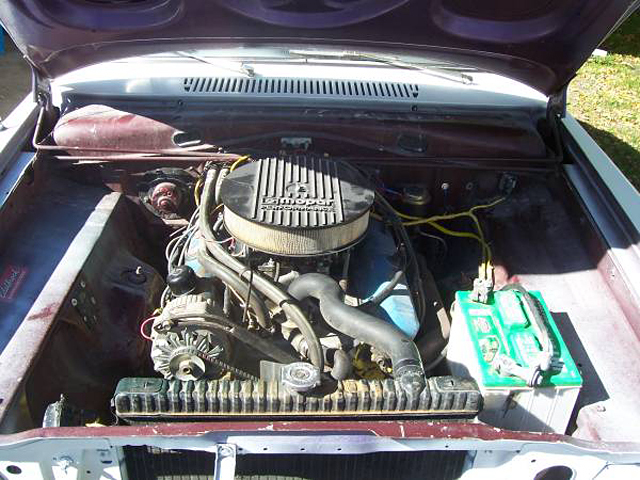 Having a V8 with a stick behind can’t ever really be a bad thing, and $4200 seems like a reasonable deal for a pony car (?) these days. 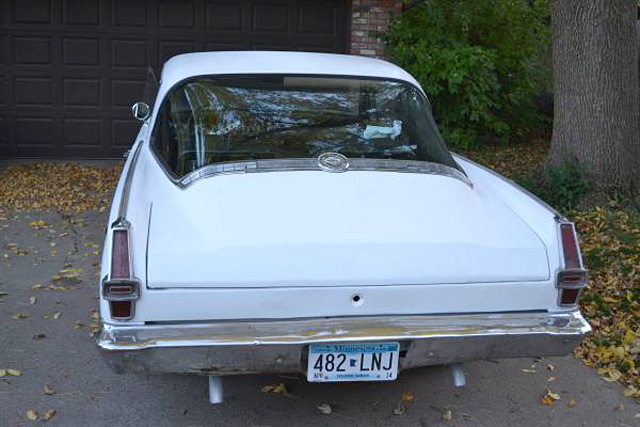 The seller says there is Bondo lurking under a mediocre respray, so you can feel decent – if not great – about just driving and enjoying it, probably all the time. The little 318 is rebuilt and probably provides a nice punch in what was considered a small car at the time. Also noted are a delaminating windshield and a sagging headliner, but so what? I don’t know why there’s a block under the front wheel, but I’d wager it has something to do with the parking brake having rusted away. But the sellers says he drives it, and has been, so it must be roadworthy enough to wander around town to the shops or park-and-ride. Pretty sure you’d be the only one at Whole Foods in February rocking a vintage Barracuda with four Winterforce snow tires. Wow! How is this car even still on the road? 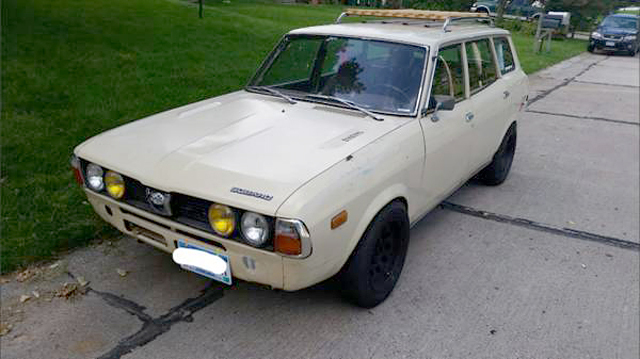 An all-wheel drive station wagon with a manual transmission. Everyone’s dream. I can’t imagine this is a very civilized car, but I’ll bet it’s unstoppable. It’s light, it has go to all four meats, and it’s as simple as a caveman’s hammer. While the floor pans have been replaced – god knows with what – there appears to be less rust than you’d expect. The bumpers are gone, but that allows you creative freedom to display your own unique vision for parking protection. Except for the driver’s seat, the interior doesn’t look like it was eaten by a badger. Things I love about this car include the functional factory hood vents, the asymmetrical gauge cluster, and the colostomy bag in the wayback acting as the rear washer fluid reservoir. It would be a shame to use it in the winter given its rarity, but it would also be a shame not to given its capabilities. $1750 is cheap, but I don’t know what I’d do with it. 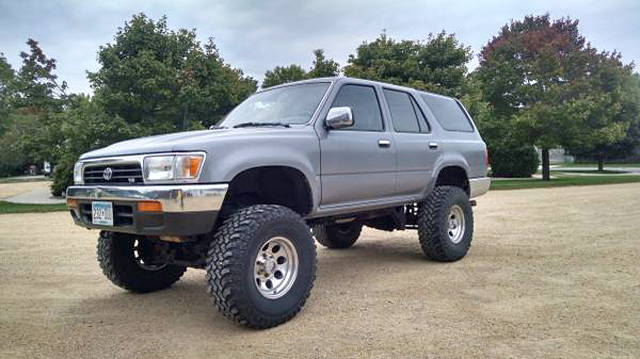 Sadly, a modified 1993 Toyota with close to 200k miles – but only 40k on the dealer-replaced long block – makes the most sense out of all of these. 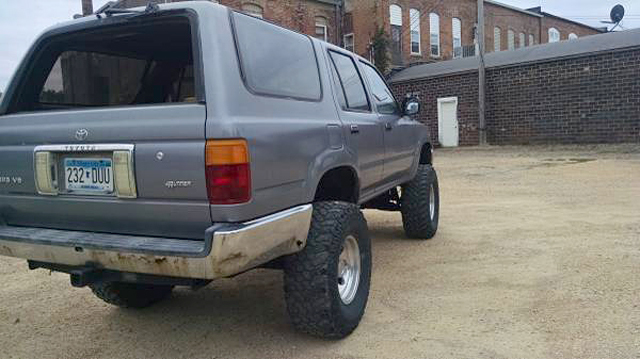 The seller claims to have dumped close to five digits into this truck, and I could believe it: new 2.5-inch exhaust system; four-inch suspension lift; big sway bars; 33-inch BF Goodrich mud tires; new huge stereo system; new fuel injectors, water pump, radiator, and power steering pump. I suspect the list goes on. It likely doesn’t have seat heaters, but with a cloth interior I care less. 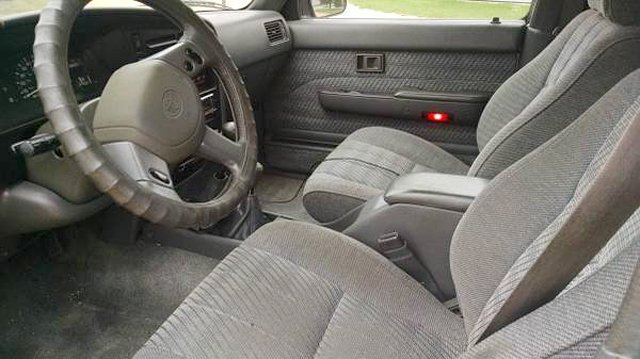 The rest of the interior looks pretty clean – could have shampooed the driver’s seat, Mr. or Ms. 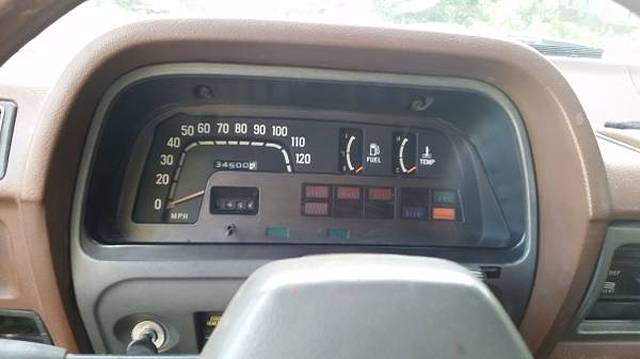 Seller – with simple Toyota switchgear and what appears to be an uncracked dashboard. The paint doesn’t look as shiny as it probably should, indicating either old southern (Arizona and North Caroline) Toyota paint or a $199 respray. The nice thing is, owing to the light color and raised chassis, you can see the car still has rocker panels and wheel arches. Yes, the rear bumper is crumbly, but that can’t be as hard to source and ship compared to, say, an entire tailgate. Hell, they’re probably available new. I would undercoat the living daylights out the thing and drive it all the time. Wash it once every week or so, and it would probably not immediately dissolve. In the end, it’s a Toyota. With reasonable care and feeding, there really isn’t a mechanical limit to their longevity. These are neat cars, but not as neat as the 1991 Peugeot 405 Mi16 for sale New Orleans, Louisiana. Not as neat at all. This entry was posted on Friday, September 19th, 2014 at 4:52 PM	and tagged with 405 Mi16, 540i, BMW, Peugeot, Plymouth Barracuda, Subaru DL, Toyota 4Runner, Z3 and posted in Totally That Stupid. You can follow any responses to this entry through the RSS 2.0 feed. Well this is a fun activity. 1600 results on our local CL substitute. My 5 most interesting based on 10 minutes. 69 MGB http://www.ksl.com/auto/listing/1670446?ad_cid=10. I had one of these. A nightmare to work on; and they always need work. But the prototypical roadster, and this one looks pretty clean. 65 Beetle http://www.ksl.com/auto/listing/1668432?ad_cid=5. Another kind of classic. This one’s “body is pretty straight”. There are actually several of these listed. Most are “not running”. Does that mean something? 02 Maxima http://www.ksl.com/auto/listing/1668796?ad_cid=11. 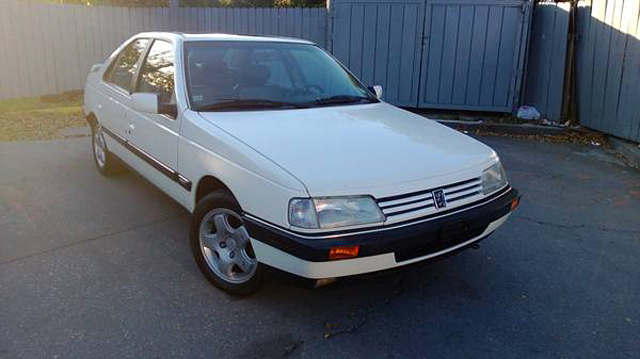 My wife had one of the original 4 door sport cars back around 89 or 90. Comfortable, fast and run driving. Not sure how they’ve held up though. 79 280 SL http://www.ksl.com/auto/listing/1578154?ad_cid=9. This one makes me think of Reed. They say sya is has a “beautiful patina”, but I always called that rust. Bet the hardware could run forever, though. 74 Chevy van http://www.ksl.com/auto/listing/1660787?ad_cid=3. Mine was a 76 E-150, but boy this is a trip down memory lane. Nothing this big feels cooler to drive. Like the challenge. How about a rotary powered triumph or a sweet black 80 MG? Add a grand and buy this. And win.